The technique of creating baskets and art from pine needles is called coiling. Pine needles are used in making coiled baskets in several regions of the United States, with local species of pine being used in each region if it is suitable. These baskets use the needles of the southern long leaf pine which is native to the southeastern United States, and the ponderosa pine which is native to the western United States. 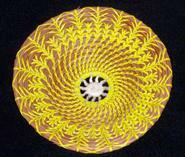 The art of coiling baskets is universally common to indigenous peoples. Coiling is part of pre-Columbian Native American crafts. Today, pine needle baskets and art are made primarily for decorative purposes. 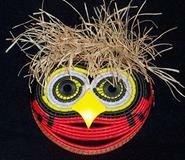 I have been creating pine needle and grass basket art since 2002. Having tried a small project I decided that this would be my niche. With the lack of any sort of professional training in my area my education consists of the purchase of one reference book and self teaching . I have only the limits of my imagination to keep me in check. My pieces are created from needles that my husband Pat and myself hand gather. Most things used in the creation of an art piece is hand crafted, from the black walnut slices that Pat saws to the wood burnings that I create, to the other art objects that I collect from other artists that are incorporated into each basket. Each of my pieces is either signed with my name or initials. Also each piece has incorporated into it a small silver feather which is my personal signature. Each of my unique pine needle baskets are accented using items such as black walnut shells, wood, antler, various stone, sea shells and more. A variety of stitches are used with one continuous coil to spiral the design. I am affiliated with the Sault Area Arts Council located in Sault Ste. Marie Michigan. My work is on display at the Arts Councils Alberta House Gallery. I have participated in the Sault Area Fine Arts Festival and have been awarded "Best of Craft" in the years of 2005, 2006, 2008, and 2012, and the "Aarre Lahti Design Award" in 2009. I have also received the "Best in Craft" award at the Cheboygan Fine Arts Fair in 2009, 2010, 2011, and 2012. My work has been exhibited at the Tawas Bay Fine Arts Show where I received second place in the fiber category in 2006. I also belong to the Wild West Basket Guild of Sedona, Arizona, and the Artistic Weaver Club in Sun City Arizona. My work is for sale at the Odawa Casino Gift Shop in Petoskey Michigan, Ward & Eis Gallery, also in Petoskey, the UP Trading Co., in Newberry Michigan, the North Haven Gift Shop on Drummond Island Michigan the Les Cheneaux Historical Museum Gift Shop in Cedarville Michigan. Also, I am represented by Studio 41, Copper Harbor Michigan, Mountain Spirit Gallery, Prescott Arizona, and the Kachina House Gallery in Sedona Arizona. I have recently embraced a part of my heritage. My mothers side of the family has Native American roots. Although there is not a paper trail that can be found to prove it I have been validated by the Medicine Man of the Chippewa Tribe of Sault Ste. Marie Michigan. My Native name is Wabashi Wagash (White Fox). Though I have developed my own style I hope that in some small way by baskets perpetuate the customs and traditions of the Native People.